When Melbourne’s Avenue Bookstore owner Chris Redfern opened a second store in Elsternwick in 2012, the year after the REDgroup collapse, some were sceptical. 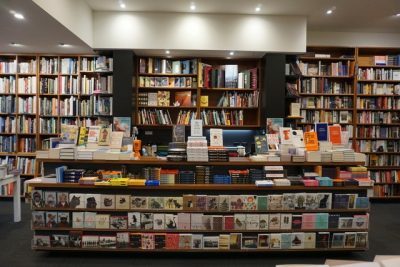 Bookseller Savannah Indigo explains how the store survived and thrived in this instalment of our quarterly Bookseller’s Diary feature. It’s a scary time for booksellers, and it’s easy to become disheartened when you have a constant onslaught of friends, family and even customers telling you that you’re working in a dying industry. I often hear customers say, ‘I’m surprised that independent bookstores still exist’, or ‘I’m amazed that you’re still here’. It’s sobering to consider how livelihoods depend on that indie bookshop staying afloat, and it’s downright puzzling when customers predict Doomsday when they’re standing in the middle of a bustling, vibrant store. Chris Redfern, the owner of the original Avenue Bookstore in Albert Park, lived in Elsternwick for more than 10 years before he made the decision to open a second store. Chris had come to know the neighbourhood and shopping strip well, and from time to time would drop into what was then the Sunflower Bookshop to chat with the owners. When asked about his impression of the shop at that time, Chris said he could see the potential, but thought it was ‘missing the changing demographic that was emerging in Elsternwick’, a demographic of families, professionals and retirees—book lovers and readers. Chris took over from the Sunflower in 2012. It was a bold move, particularly following the collapse of REDgroup and the closure of Borders and Angus & Robertson in 2011. Many booksellers and publishers were sceptical, but Chris’ intuition, knowledge and team of experienced booksellers saw the shop grow from a location with potential to a successful business. In 2016, he opened a third store in Richmond. I’ve watched Chris work hard to juggle all facets of bookselling: ordering the appropriate stock for each location, managing staffing requests and logistical issues, and attempting to oversee every sale, customer and event. He works collaboratively with managers and booksellers alike to build a strong team and business. As someone who has worked at the Elsternwick store for the past three years, I’ve been included in a range of discussions, as we explore ways to improve the store and decide where to direct our attention. We try to keep a degree of consistency across our stores, while understanding that each one must suit its locality and customer base. The Elsternwick store has a longstanding Jewish clientele, and we strive to maintain a strong presence at community events. We regularly run pop-up stores at the local cinema, schools and community festivals, and we support local authors whenever we can by hosting in-store events. We have regular staff who get to know the customers, to discover what they like and recommend and order accordingly. We have a wide range of new-release titles on display, as well as hand-picked consignment stock from local authors, but it’s safe to say that we all have different tastes and, often, it’s the customers who are hand-picking us for our recommendations. One of the best things about indie bookstores is that they’re shaped by the people who run them. The personality of the business is built when a bookseller orders a collection of Icelandic essays or reads The Argonauts for the first time and subsequently orders every Maggie Nelson book ever written. It’s made when someone spends over an hour with a family they’ve sold to for years, to make sure every member of that family leaves with the perfect book in their hand. And it’s made when the store’s owner and managers trust their booksellers to do what’s right for the shop. At the Avenue, we’re given the opportunity to take initiative, to order our favourite (often obscure) books, and to let our personalities show through our book choices and interactions. When customers say they’re amazed bookstores are still around, I tell them that we’re a thriving business, and that we plan to stay that way.